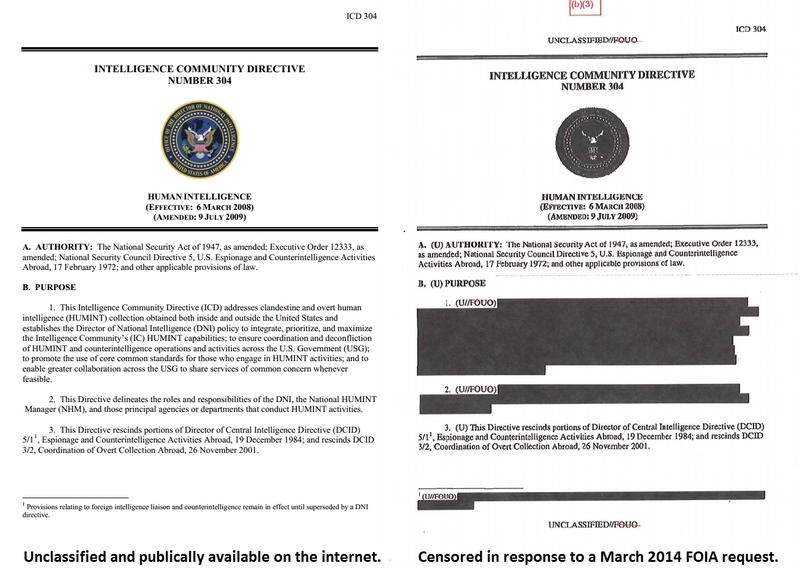 The Unredacted website draws our attention to an "Intelligence Community Directive" which was heavily censored before release -- even though the same text had previously escaped onto the internet without any blacked-out portions. A comparison of the two versions is here. The redacted portions are labeled U/FOUO, which Unredacted finds "mysterious." Actually, FOUO (a term mostly used by the military) stands for For Official Use Only, which is explained here. UNCLASSIFIED/FOUO is primarily a Department of Defense phrase/acronym, used for documents or products which contain material which is exempt from release under the Freedom of Information Act. It is treated as confidential, which means it cannot be discarded in the open trash, made available to the general public, or posted on an uncontrolled website. It can, however, be shared with individuals with a need to know the content, while still under the control of the individual possessing the document or product. Information that may be protected with these labels range from personally identifying information such as passport and Social Security numbers to documents protected by the attorney–client privilege. If you go here, you'll see that text marked FOUO has nothing to do with national security. 1. This Intelligence Community Directive (ICD) address clandestine and overt human intelligence (HUMINT) collection obtained both inside and outside the United States and establishes the Director of National Intelligence (DNI) policy to integrate, prioritize, and maximize the Intelligence Community's (IC) HUMINT capabilities, to ensure coordination and deconfliction of HUMINT and counterintelligence operations and activities across the U.S. Government (USG); to promote the use of core common standards for this who engage in HUMINT activities; and to enable greater collaboration across the USG to share services of common concern wherever feasible. 2. This Directive delineates the roles and responsibilities of the DNI, the National HUMINT Manager (NHM), and those principle agencies or department that conduct HUMINT activities. Why cover up this stuff? Perhaps the writer felt embarrassed by the semi-colons which should have been commas. Or by the ghastly neologism "deconfliction." HUMINT is a commonly-used term in the intelligence community. It refers to much of the stuff we normally think of when we think of spies: Running agents, infiltration, interrogations, that sort of thing. Torture is one way to extract HUMINT. Another way is to strike up a friendly conversation with a targeted individual. The National Humint Manager is another term for the Director of the Central Intelligence Agency. So either the CIA is breaking the 1947 act -- and there's a long history of that -- or another agency is spying on Americans. Whoever these people are, they've been infiltrating groups, paying informants, chatting people up, and otherwise getting the info they want. This domestic HUMINT data is being shared with CIA. We know this because the Director of the CIA is also the National HUMINT Manager. In other words, they've done an end run around the spirit and letter of the National Security Act of 1947. They get away with this because the intelligence community was reconfigured under Dubya without any national debate or dialogue. Since we're the ones bankrolling all of this stuff, why aren't we allowed to know just which agency of the U.S. government is spying on us? Is it CIA? Or is it someone else? Here's another question: What's with that "FOUO" marking? It's not as though those two paragraphs contain any Social Security numbers or anything of that sort. Deconflict is a word in that it has been used somewhat regularly for some period of time. But not without controversy. It seems to be a word used in the military at least since the 1970s. "Re: Al Haig Nonword "Deconflict." Shame on you! It must have been a slow news week for you. Deconflict is a perfectly good word which conveys precisely what it is intended to: the reverse of conflicting." "As for verbs, civilians can get away with using English most of the time, but there are a couple of high-impact verbs to keep in mind. "Prioritize" is the word most military people claim they hate to use but use anyway. As best as I can trace it, "prioritize" was first used during Alexander Haig's tenure as Secretary of State. It is a word familiar to everyone in the US government, so it shouldn't pose much of a problem for those with no previous training in militaryspeak. However, a much more powerful and versatile verb is "deconflict." Given the chance, civilians will choose wimpy words like "compromise," "mediate," or "negotiate." Military officers, on the other hand, can simply use "deconflict" to cover all such unpleasant situations. I've also come to use "deconflict" in place of "prioritize," because deconflicting connotes accomplishment whereas prioritizing sounds almost wishy-washy by comparison. On those days I don't actually get any work done, I can always claim I deconflicted my schedule; it at least sounds as if I spent time wrestling with a difficult problem. If I just say I prioritized my workload, however, I find it harder to cover up for procrastination." "SEC. RUMSFELD: The precise arrangements for NORTHCOM, needless to say, are in the very early stages. A combatant commander has not been named, as yet. We expect to do that within a very short period of time. And the command would stand up October 1st. Exactly how it would -- right now, the relationship between the defense establishment and the Coast Guard is of course intimate in that regard. And there is a high degree of cooperation, coordination and in some instances deconfliction(?) so that the Coast Guard, which has a significant role in that regard, is able to function." The bolding is mine, the question mark is in the transcript. The agency spying on us could be the FBI. Fascinating info! And here, I thought *I* had some research abilities...!